Jan Jaap Minnema at Fraser Yachts sends me word that the price of his central agency, the 39m motor yacht Pretty Woman, has been reduced and now, says Jan Jaap, "Is the only Dutch superyacht of this size and price." 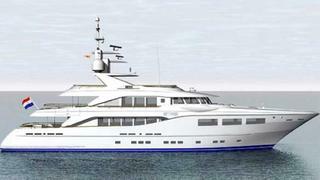 Pretty Woman is a true bluwater cruising superyacht, due for delivery by Holland's Hakvoort yard on June 20th, 2010. Lloyds classed and MCA compliant, she's ideal for charter, sleeping 12 guests in a main deck full beam master suite along with two double and two twin cabins plus two Pullman berths. Built to a design by Cor D Rover with an interior by Michela Reverberi, Pretty Woman has a range of 5,500 nautical miles at nine knots. Previously marketed at €21.9 million, she's now asking €19.75 million.